If you think you can avoid McDonald’s when you travel then you better be going to North Korea or Cuba. McDonald’s “restaurants” look the same everywhere: cheery decor; bored staff attending to drive-thru windows; scary clown images and plastic trays. The thing that sets them all apart in different countries is the price and the menu. I’ve visited McDonald’s outlets in 15 countries in my research, I’ve put on over 3kg, they’ve been quite a few sugar highs. All this seems worthwhile as today I give you A McTraveller’s Guide, containing the highlights of my McOdyssey. In 2013, Japan put out a limited edition “Gold Ring” Quarter Pounder in a jewellery box with a special bag and a ribbon for $11. Some people have nothing better to do with their money and it’s cheaper than heroin. Pork features heavily on the menu, so don’t be coming in search of kosher or halal treats at McDonald’s Japan – or anywhere in Japan for that matter. Odessa is the Ukraine’s most cosmopolitan city: the restaurants lining the beautiful, tree-lined streets downtown offer every type of cuisine. Of course, McDonald’s has to compete with them, so they have their own international menu. Last year they dabbled in Asian Fusion. 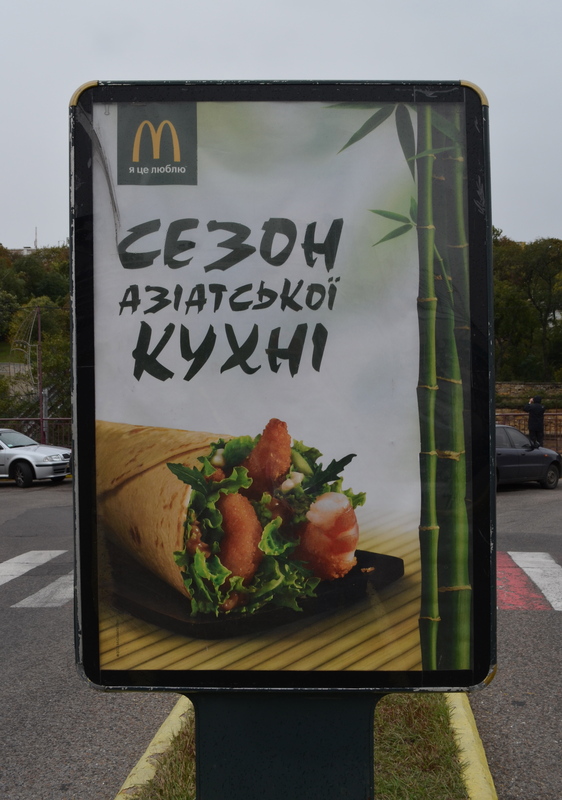 One thing to be said for McDonald’s in the Ukraine: it’s rather expensive. For the price of a Big Mac and fries one could get some delicious, fresh local dumplings, or other Ukrainian delicacies. 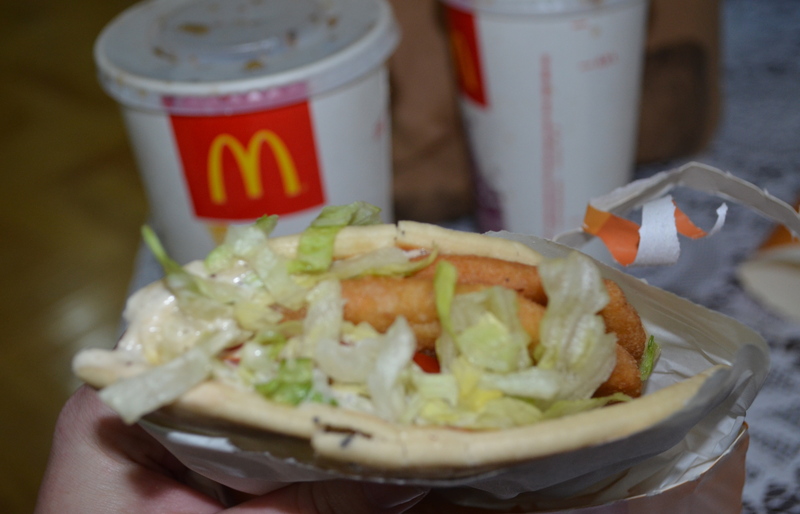 Turkey’s McDonald’s serves the standard McSuspects with the exception of their signature McTurco, which is absolutely vile: pieces of chicken floating in mayonnaise wrapped a floury, tasteless pita pocket. 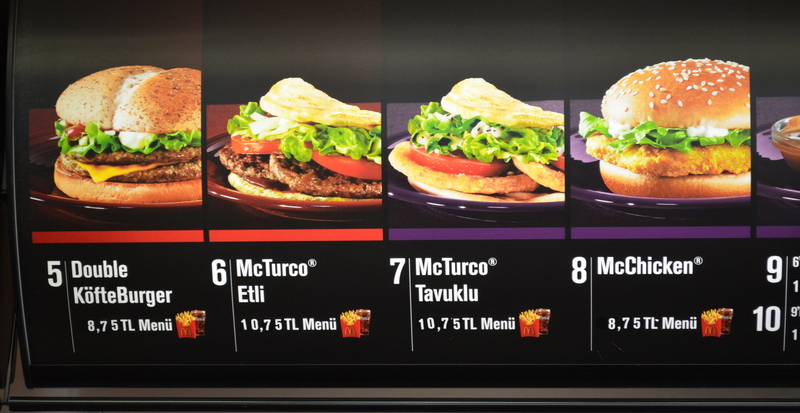 I don’t think the average Turk is stupid enough to try it – they seem to stick with the Big Macs and leave this McTurco catastrophe to the unwitting tourists. The McTurco is, as far as I can tell, identical to the McArabia available in the UAE and Qatar. Very sneaky of you, McDonald’s. We’ve caught you out on this one. …but of course, it wasn’t. Turkey’s menu is otherwise unremarkable. One thing that is different about McDonald’s in this country is that people tend to spend a particularly long time lolling on the plastic seats after their McLunches, checking phones and chatting with friends. Australians are McFood snobs of the highest order, there is no question about that. Locals who are appalled at the notion of consuming a Big Mac have taken a shine to the Angus McOz, a prime Angus beef burger served with red onion and a particularly Australian addition: the slice of beetroot. Australians try to make themselves feel better about eating at McDonald’s because it is a place that serves salads, 100% Australian chicken breast wraps and yoghurt. We’re still getting fatter every year. “McDo” is phenomenally popular in France. In fact, it’s McDonald’s second biggest market. The fast food chain attempted to seduce the French public with McBaguettes and the McCamembert, made from inferior bread and the poorest quality Camembert. Obviously, these products were rather unsuccessful in the land of pain and fromage. 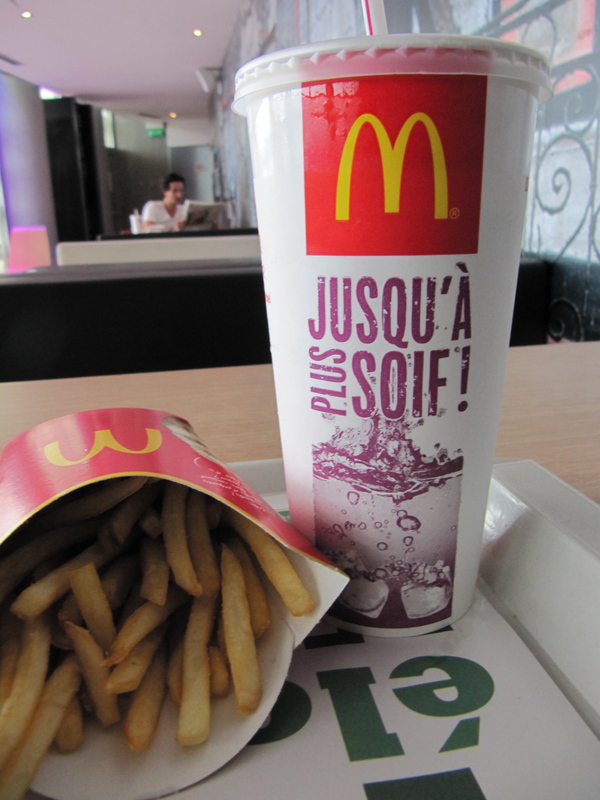 Quite simply, the French visit McDonald’s to get classic fast food: Big Macs, Chicken McNuggets, and McShakes. Miam, miam. McDelicieux! The people of Hong Kong really love their vegetables, so McDonald’s has catered for the locals yet again: broccoli, corn and rice are currently on the menu. Actually, they are quite McNice. Macaroni is a unique breakfast staple at Hong Kong McDonald’s. Desserts here include bean-flavoured ice cream parfaits. There are many 24-hour McDonald’s in this busy, 24-hour city. McDonald’s in Hong Kong and China always puts out a special menu for Chinese New Year. Hey vegetarians, wondering why the fries are so good at McDonald’s in Hong Kong? It’s the pig fat in which they are cooked. 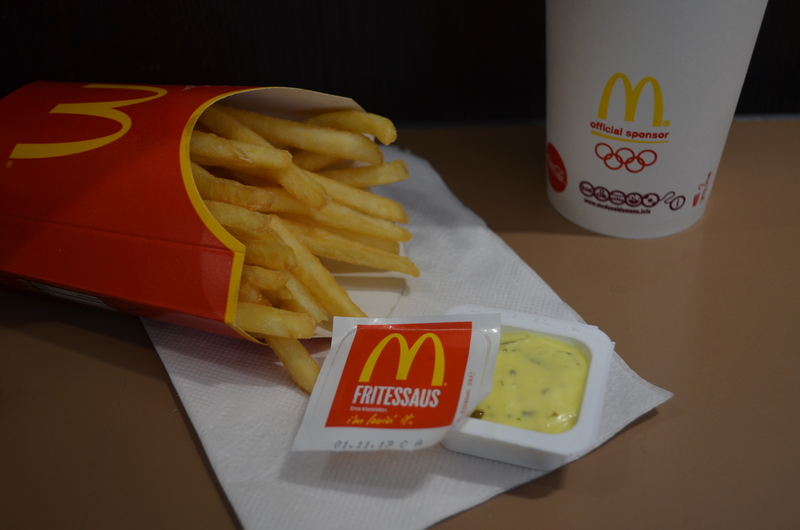 The Good: it wouldn’t have taken McDonald’s long to figure out that Dutch people won’t eat chips without fritessaus – a sweet, flavoured mayonnaise sauce that is ubiquitous in Holland. I’m with the Dutch on this one, fritessaus really should be available in every country. If you like miscellaneous meat, breaded and deep fried in a kind of mustard then you may also enjoy a McKroket with your fries. Just looking at it gives me indigestion, but those of you with a strong stomach are advised to give it a shot. Readers with further evidence supporting the existence of Joppie Burgers are encouraged to write to us and share their experiences. 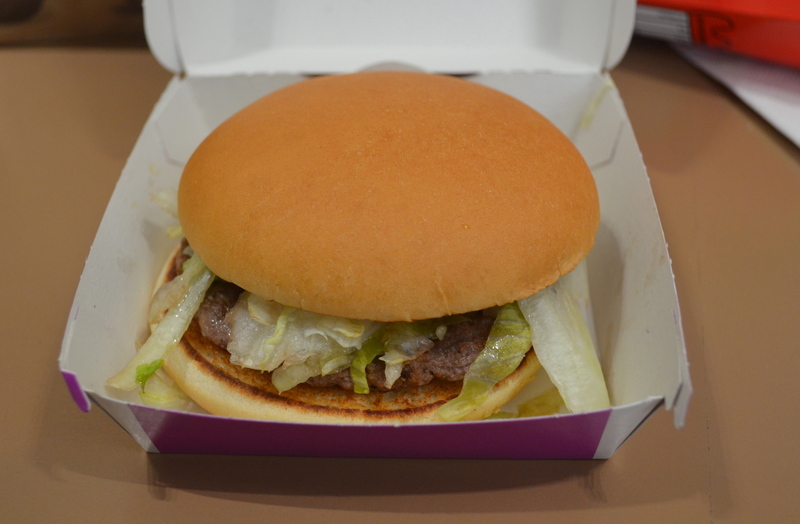 – Singapore’s Chinatown outlet forgot to put the chicken on our McChicken – just lettuce and sauce. On two separate occasions! Well, I think I’m finished with Mcshakes and fries for this year. Be sure to try the local delicacies in any country you may be visiting, none of which you’ll find at McDonald’s. We’re on an around the world trip and see McDonalds in most places we’ve been (though, come to think of it, not Cambodia. Is there one there?) I always assumed they all served the standard US menu so it was interesting to see the successes and failures of offering local menu options. And even more amazing you’ve been to these and tried them! Hah! Thank you, I am glad you noticed it too. Many people don’t see that. There wasn’t one in Cambodia last time I was there, but they had a fake McDonald’s called Lucky Burger – did you see it? It’s dreadful that I remember that! You’ve certainly done your research! I’ve seen taro filled pies (instead of apple) in Taiwan. I’ve seen them, Linda! Actually, they look good but I am partial to all those purple taro sweets.Yummy. The differences in McDonalds meals around the world are interesting since most people would assume they just sell the same burgers everywhere. I don’t eat meat so idea of going to one in India and being able to eat the menu intrigues me. Even though it’s still fast food! Yes indeed, points of cultural difference shown by McDonald’s. They are good for something I guess! Maybe you could do one of these for Starbucks sometime! Thanks! It was a fun project – I wonder about Starbucks… they all smell the same. The snacks are different. What do you think? I love trying McDonalds in every country I go to (only the items I can’t get at North American McDonalds though), My favorites were the ebi (shrimp) burger in Japan and the fried KFC-style chicken in Peru! Wow, I must try that when I get to Peru. You sound like a perfect travel partner! 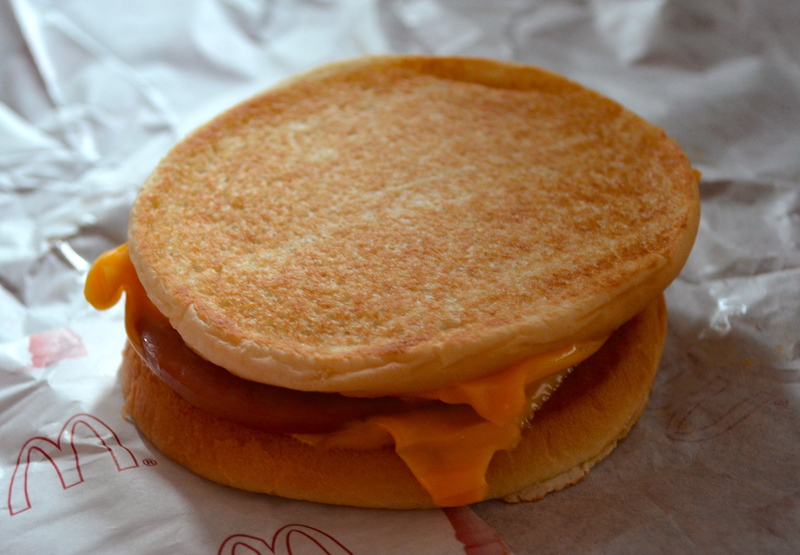 Great rundown of the quirky things McDonald’s serves around the world. I don’t do this any more (though I just did a Burger King in Mexico). But when I was travelling in Australasia long ago I remember having a Teryaki McBurger in Tokyo and a Prosperity Burger in an extra-long bun during Chinese New Year in Malaysia. And if my memory serves me, the special burger in Australia had a slice of beet in it. How interesting! 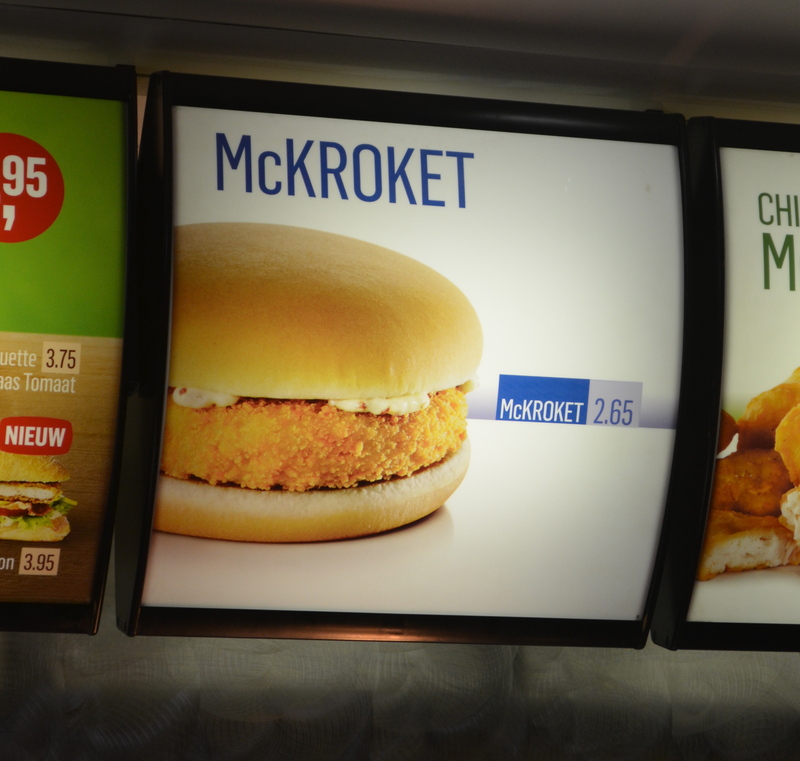 For me, I love going to McDonalds in other countries just to see the menu written in the language of that country. A McDonalds menu in Korean, Chinese, Japanese, etc. looks so familiar but at the same time looks so foreign! Yeah! It’s like a ritual isn’t it? Checking out the international McDonald’s!